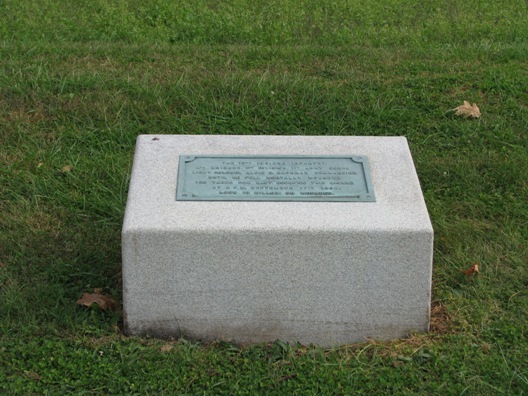 150 yards due East, occupied this ground at 2 p.m. September 17, 1862. Loss, 13 killed, 58 wounded. Iron Brigade. 2, 6 & 7 Wis. 19 Ind. & 24 Mich. Vol's. Consolidated with 7th & 20th Ind. 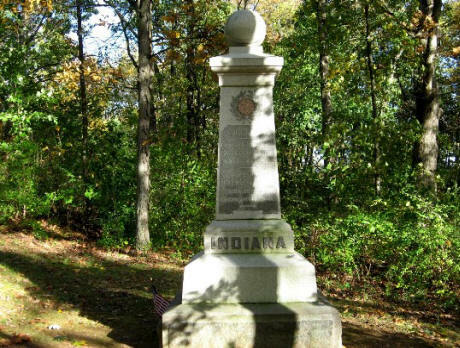 Organized at Indianapolis, Ind., and mustered in July 29, 1861. Left State for Washington, D.C., August 5. Attached to 3rd Brigade, McDowell's Division, Army of the Potomac, to March, 1862. 1st Brigade, King's 3rd Division, 1st Army Corps, Army of the Potomac, to April, 1862. 3rd Brigade, King's Division, Dept. of the Rappahannock, to June, 1862. 4th Brigade, 1st Division, 3rd Army Corps, Army of Virginia, to September, 1862. 4th Brigade, Iron Brigade, 1st Division, 1st Army Corps, Army of the Potomac, to June, 1863. 1st Brigade, 1st Division, 1st Army Corps, to March, 1864. 1st Brigade, 4th Division, 5th Army Corps, to August, 1864. 3rd Brigade, 3rd Division, 5th Army Corps, to September, 1864. 1st Brigade, 3rd Division, 5th Army Corps to October. SERVICE.--Affair at Lewinsville, Va., September 11, 1861. Reconnoissance to Lewinsville September 25. Occupation of Falls Church September 28. Duty at Fort Craig, Va., until March, 1862. Advance on Manassas, Va., March 10-16. Camp at Upton's Hill until April 9. Advance on Falmouth, Va., April 9-19. Duty at Falmouth and Fredericksburg until May 25. McDowell's advance on Richmond May 25-29. Operations against Jackson June 1-21. At Warrenton until August 5. Reconnoissance to Orange Court House July 24-27. Reconnoissance to Frederick's Hall Station and Spottsylvania Court House August 5-8. Thornburg's Mills August 5-6. Pope's Campaign in Northern Virginia August 16-September 2. Fords of the Rappahannock August 21-23. Sulphur Springs August 26. Gainesville August 28. Groveton August 29. Bull Run August 30. Maryland Campaign September 6-22. 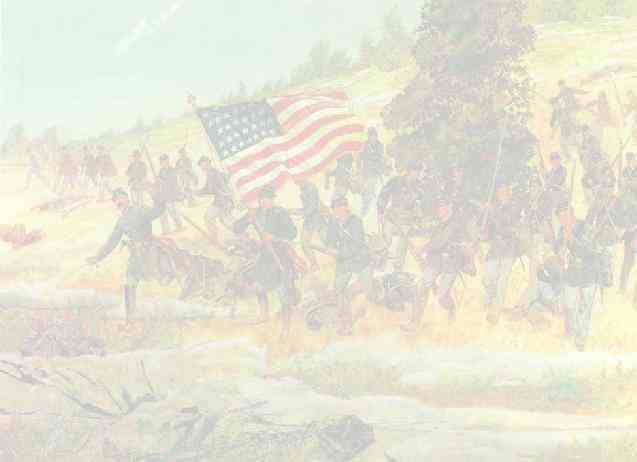 Battle of South Mountain September 14. Battle of Antietam September 16-17. At Sharpsburg until October 30. Movement to Warrenton, thence to the Rappahannock October 30-November 19. Battle of Fredericksburg, Va., December 12-15. Burnside's 2nd Campaign ("Mud March,") January 20-24, 1863. Duty at Falmouth until April. 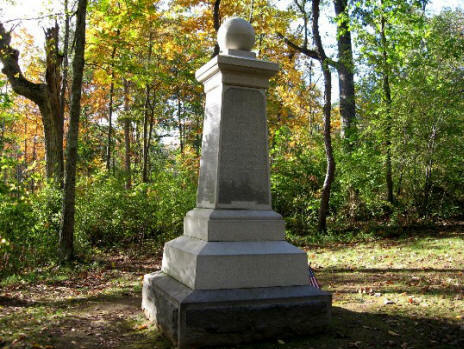 Chancellorsville Campaign April 27-May 6. Operations at Pollock's Mill Creek April 29-May 2. Fitzhugh's Crossing April 29-30, Battle of Chancellorsville May 2-5. Expedition to Westmoreland County and operations on Northern Neck May 20-26. Gettysburg (Pa.) Campaign June 11-July 24. Battle of Gettysburg July 1-3. Pursuit of Lee to Manassas Gap July 5-24. At Rappahannock Station and Culpeper August 1 to October. Bristoe Campaign October 9-22. Advance to line of the Rappahannock November 7-8. Mine Run Campaign November 26-December 2. Demonstration on the Rapidan February 6-7. 1864. Campaign from the Rapidan to the James River May 4-June 15. Battles of the Wilderness May 5-7; Laurel Hill May 8. Spottsylvania May 8-12. Spottsylvania Court House May 12-21. Assault on the Salient May 12. North Anna River May 23-26. Jericho Ford May 23. On line of the Pamunkey May 26-29. Totopotomoy May 28-31. Cold Harbor June 1-12. Bethesda Church June 1-3. Bottom's Bridge June 12. Before Petersburg June 16-18. Siege of Petersburg June 16 to October 18. Non-Veterans mustered out July 28, 1864. Weldon R. R. August 18-21. Consolidated with 20th Indiana Infantry October 18, 1864. Regiment lost during service 5 Officers and 194 Enlisted men killed and mortally wounded and 1 Officer and 116 Enlisted men by disease. Total 316.